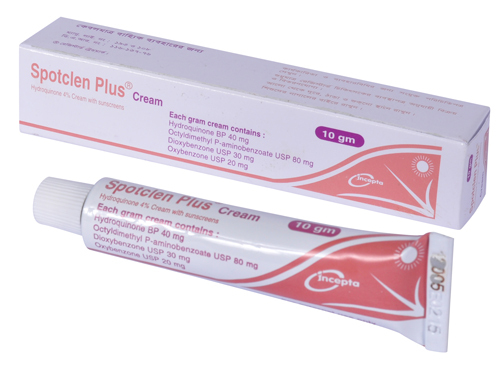 Spotclen Plus Cream: Each gram cream contains Hydroquinone BP 40 mg, Octyldimethyl P-aminobenzoate USP 80 mg, Dioxybenzone USP 30 mg and Oxybenzone USP 20 mg.
Hydroquinone is a skin bleaching agent. Topical application of hydroquinone produces reversible depigmentation of skin by inhibition of the enzymetic oxidation of tyrosine to 3,4- dihydroxyphenylalanine (DOPA) and suppression of other melanocyte metabolic process. Exposure to sunlight or ultraviolet light will cause repigmentation of bleaching areas which may be prevented by the broad spectrum sunscreen agents contained in the Spotclen Plus cream. * for the gradual bleaching of hyperpigmented skin conditions such as chloasma, melasma, freckles, senile lentigines and other unwanted areas of melanin hyperpigmentation. * to reduce hyperpigmentation caused by photosensitization associated with inflammation or with the use of certain cosmetics. Hydroquinone should be applied to the affected area and rubbed in well twice daily or as directed by a physician. Most discolorations begin to lighten after 3 or 4 weeks of treatment but it may take longer. After desired bleaching, use only as needed to maintain results of treatment. After reduction of hyperpigmentation, use of sunscreen agents and/or protective clothing should continue on bleached skin to prevent repigmentation. Use in children: Safety and efficacy in paediatric patients below the age of 12 years have not been established. No systemic adverse reactions have been reported. Occasional hypersensitivity (localized contact dermatitis) may occur in which case the medication should be discontinued. Test for skin sensitivity before using by applying a small amount to an unbroken patch of skin to check in 24 hours. Minor redness is not a contraindication, but where there is itching or vesicle formation or excessive inflammatory response, further treatment is not advised. If no bleaching or lightening effect is noted after 2 months of treatment, the medication should be discontinued. Contact with the eyes and lips should be avoided. Hydroquinone should not be applied to cut or abraded skin. Pregnancy: It is not known whether hydroquinone can cause fetal harm when used topically on a pregnant woman or affect reproductive capacity. It is not known to what degree, if any, topical hydroquinone is absorbed systemically. Topical hydroquinone should be used in pregnant woman only when clearly indicated. Lactation: It is not known whether topical hydroquinone is absorbed or excreted in human milk. Caution is advised when topical hydroquinone is used by a nursing mother.